Today’s topic is not a pretty one, but I think it’s a common one! Adult acne has been part of my life for the last couple of years. I remember being a teenager and thinking how cool it would be to grow up and never have to worry about getting zits ever again. Well, I must not be all grown up because I still get them and so do a lot of adults I know! Having those occasional pimples is terrible, and if you’re like me, you will wear makeup to cover them even if you have to make a quick run to the grocery store. At some point after trying a million different products and remedies, I thought there was nothing I could do about them. However, when I got pregnant, my complexion was beautiful–I didn’t get one zit. So, I figured that there was something I could do about it. I knew it had to do with something inside and not just the products I was using. I did some research and found a solution! And when I say solution, I don’t mean just one thing–it’s a change in lifestyle and products. But before we get into this, let’s talk about adult acne and what causes it in the first place! Hormones. I have always had problems with this because I have Polycystic Ovarian Syndrome. Your Diet! Too much sugar, carbs and dairy have been blamed for causing breakouts too. If you are like me and you can’t avoid dessert after every meal, this might be a problem. Stress. Nowadays, who doesn’t live even a little stressed!! Products. This one might seem obvious, but using the wrong skin products can definitely be a trigger. So, as you can see I have them all (haha). So, of course, it makes sense that I have it! So what did I do to solve it? Today, I am almost 100% breakout free (yay)! I committed to changing my lifestyle. Here’s how! How Did I Get Rid of the Occasional Pimples? First, I made a commitment to change my diet, but in a realistic way. For example, I have made a conscious effort to eat more fresh food over highly processed foods. I’ve tried to have a diet low in sugars, fried foods, and grains who are all food groups blamed for causing acne. Instead, I try to focus on eating more fruits, vegetables, nuts, and seeds. I also started off my healthy new habits with a strong detox, which included healthy eating but also taking Liver Detoxification Enzymes. Another thing that helped me was drinking LOTS of water to help my body get rid of toxins and hydrate my skin. I am also exercising 3 times a week, which is a big improvement from my previous zero times a week (haha). I also started taking Digestive Enzymes and probiotics two times a day. Now I understand that you are not what you eat, but what you can actually digest. This was the most important point–it truly made a huge difference. With all the cooked foods that we eat, we should all take digestive enzyme supplements to help our bodies better digest our foods. I love the ones from Divine Nature, a local AZ company. 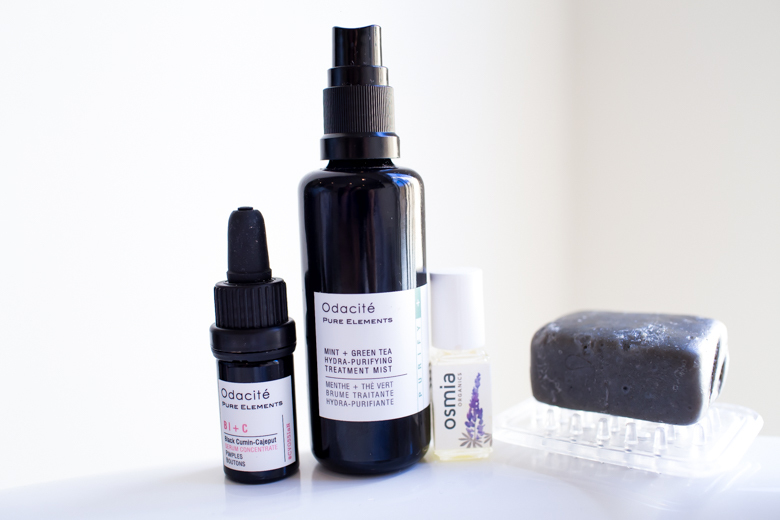 Face wash and soap: Osmia black clay soap in the morning and Patyka face wash at night. Toner/Mist: Odacité Mint and Green Tea Mist. Foundation: Kjaer Weis Cream Foundation–this is the best foundation I have ever tried, in addition to having natural ingredients it has really helped my skin. As you can see, it was not just one change that helped me to get rid of my acne. It was a true lifestyle change! Also, most importantly, I dedicated time to learn and research the topic. I highly recommend a book called Micro Miracles. I am not exaggerating when I say I owe a lot of these choices to what I learned in this book, and getting rid of acne was just one of the many benefits I have experienced from following the book’s advice. I hope you guys enjoyed the post and if you are experiencing this problem, I hope one day you can finally feel confident to go get coffee on a Saturday morning without wearing makeup (haha). Thanks for stopping by, and I’ll see you in my next post!